Are you saying Hawaiians like to eat? Today is Kamehameha Day, a public holiday in Hawai’i to honor Kamehameha I, who was the first ruler of the united Kingdom of Hawai’i. On Kamehameha Day, Hawaiians drape leis on statues of Kamehameha. 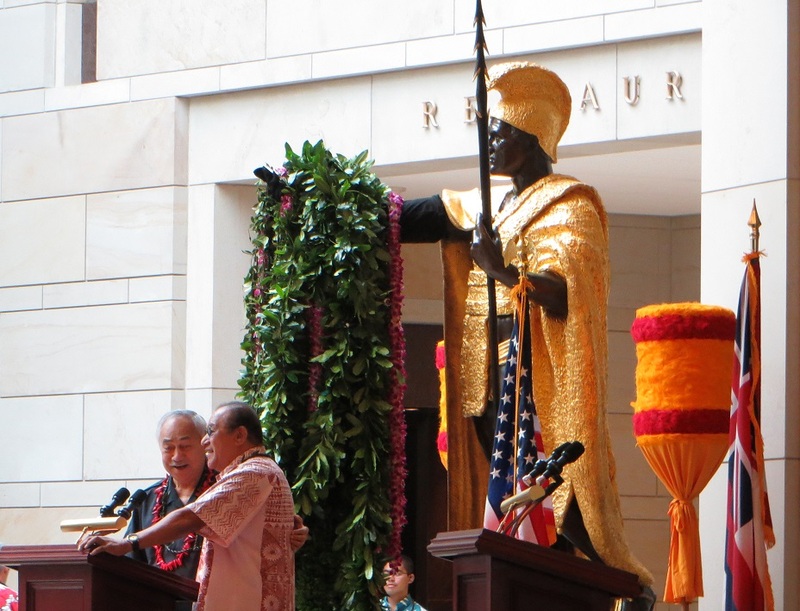 The lei draping tradition came to DC when a Kamehameha statue was presented to the U.S. Capitol in 1969. The Hawai’i State Society of DC and the Hawai’i congressional delegration sponsor the ceremony, which involves not only the lei draping, but lots of hula, traditional music and speeches from politicians. The politicians all gave canned stump speeches. All except Eni Faleomavaego, the U.S. congressman from Samoa (he was raised in Hawaii). “So appropriate that a Hawaiian should be standing at the entry to the food court,” he said of the placement of the statue in front of the Capitol Visitor Center restaurant. Gallery | This entry was posted in Washington DC and tagged Hawaii State Society, Iao Valley, Kamehameha, Kamehameha Day, Thomas Ridgeway Gould. Bookmark the permalink.